A trip in support of a project that is worth telling. The adventure this time was not the search for freedom and nature, but of solidarity. A type of ‘do-gooder magic’, that combined the joy of riding with the desire to sacrifice a bit of their own time to let those who find themselves in a far off corner of the world know that someone is thinking about them. The two protagonists of the story were Debora and Piero. At times it’s necessary to reflect a bit on your own life and about how you have lived it up till now. It often happens after discovering and triumphing over a horrible diagnosis. You look back and realise that the time has come to do something more for others, to give a hand to those who are in need. This is exactly what happened to Piero and Debora, the protagonists of the motor biking trip which we’re about to tell you about. 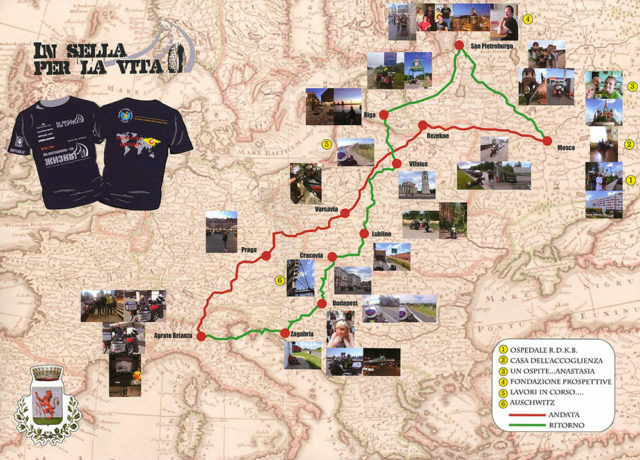 From this premise the association “INSELLAPERLAVITA” (On the road for life) and its various projects were born. This is a recently formed association that wants to be known, and to let people in need of support (also simply moral support) know that they exist. In setting up this project Debora leaned on the precious support of a monk from the missionary of Bergamo, whom she met many years earlier in Thailand when he was busy setting up an orphanage (which to this day is still going strong). Exactly, children. Who more than them is need of help? And it’s exactly for this reason that project “Destination Russia” developed. 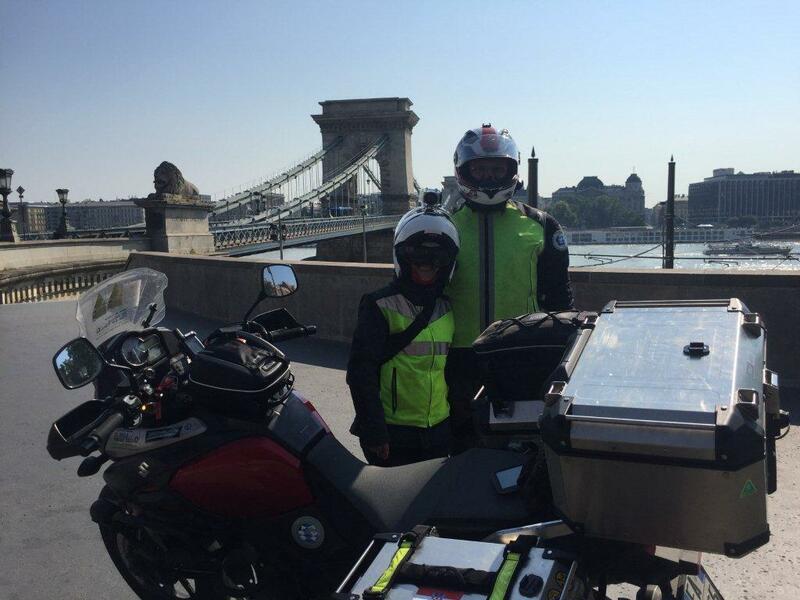 The idea of Piero and Debora, experienced motorbike travellers, started from research on the internet in order to work out to whom they should propose the idea. Amongst the thousands of projects and non-profits present on the internet, the one which really stood out was “AASIB – AIUTATECI A SALVARE I BAMBINI” (Help us save the children). An email of introduction quickly led to a meeting, in Rovereto, with the president Dr. Ennio Bordato. Our 2 riders explained to us that it was imperative to have a face to face meeting to understand if they were all on the same wave length. And they were. “AASIB” has operated in the Federation of Russia since 2001 and has been a promotor of ‘Casa dell’Accoglienza’, a sort of guest house designed as paediatric lodgings, and is currently supporting other projects involving the care of victims of the war in the Ukraine, a war which little is spoken about, but where thousands die every year, where people suffer because of a lack of access to medicines and the black market that has formed around them. 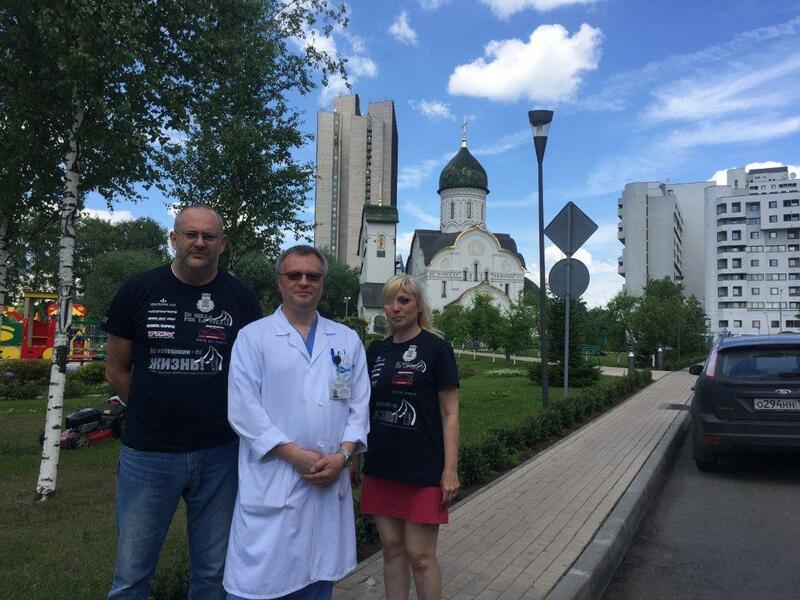 Before leaving for Russia, Piero and Debora heard the request for an urgent need of medicines for children in Ukraine, and so they organised the collection and shipping through their association involving private individuals, doctors, pharmacies and the ‘Banco del farmaco’ (an Italian non-profit that is committed in getting medicine to those in need). This commitment led to 4 crates, some of which have already been sent, while the others are ready to go, just awaiting to finish the bureaucratic process. “Initially we were supposed to go first to Ukraine, then to Moscow and St Petersburg. We were advised against crossing war territories, there was the possibility of not being able to reach the medical assistance zones and what’s more, the delivery dates for the medicine and those of the trip just weren’t compatible. However, we thought it was useful to check the activity of the association that we were going to support and so the idea was to arrive in Moscow, cornerstone of the association of Bordato, exactly in the days (22-25 June, 2016) of the presentation of a book of Russian fairy tales for children and to meet the director of the paediatric cancer hospital of the city (R.D.K.B). Bordato welcomed us at the airport and took us on a 2-day trip to the homeless shelter, where we could take presents and teddy bears, then to the Orphanage, where they look after orphans with serious illnesses (not only cancer). The description of the structure was made in a detailed manner because we believe that we can play a hand in ensuring necessary improvements can be made. For us it is important to observe every aspect so that we could report with utmost transparency that which we saw. 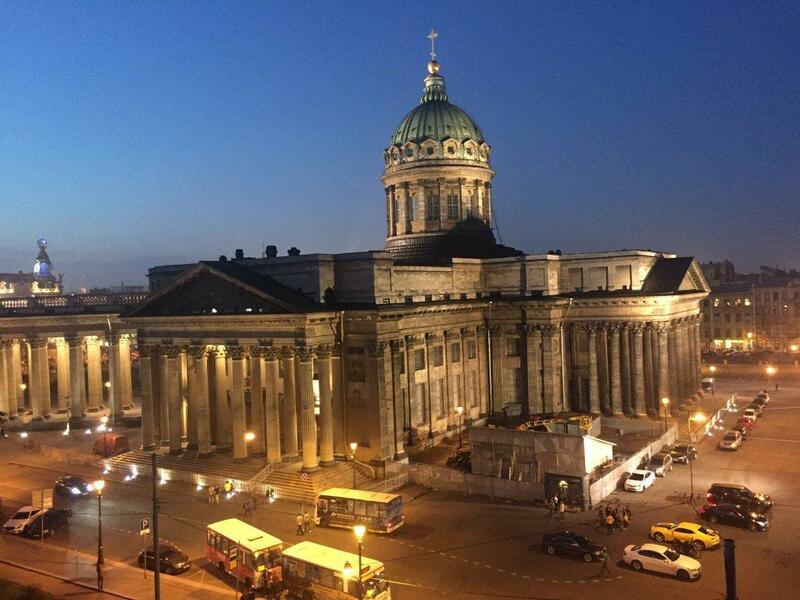 Once we left Moscow – continues Piero – we went to Saint Petersburg to meet the representatives of the FONDAZIONE PROSPETTIVA which help disabled children. This meeting was organised because we wanted to know where else we were needed and to verify the possibility of future collaborations and aid. We learnt about this Foundation through Dr Marta Dell’asta, a researcher at the Fondazione RUSSIA CRISTIANA and a resident for many years at the Federazione Russa. 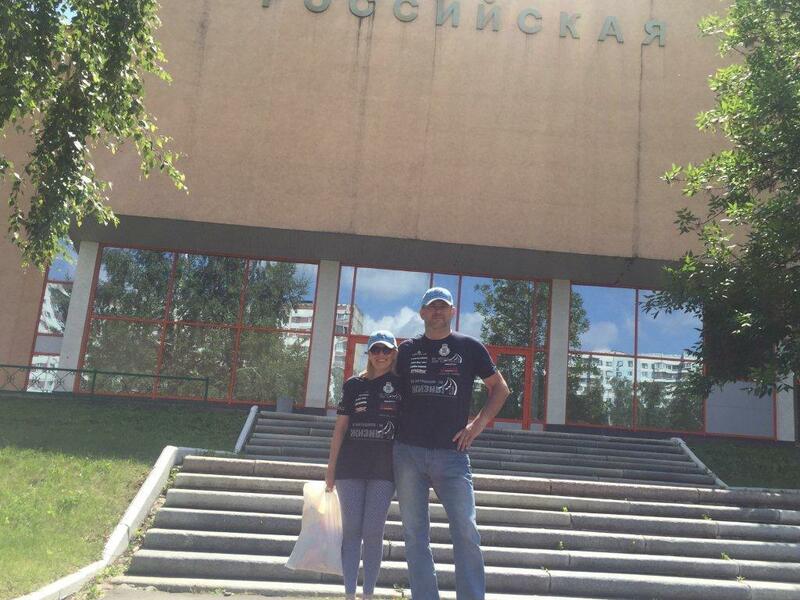 The organisation of “DESTINATION RUSSIA” took Piero and Debora more than 4 months to prepare. This period of time was necessary to gather medicine, meet companies in the hope to gain sponsorship, plan the journey, prepare the motorbikes, request permits and visas….. Taking into consideration all this work, the two protagonists decided to do as many kms as possible each day, to make the most of the little time that they had. 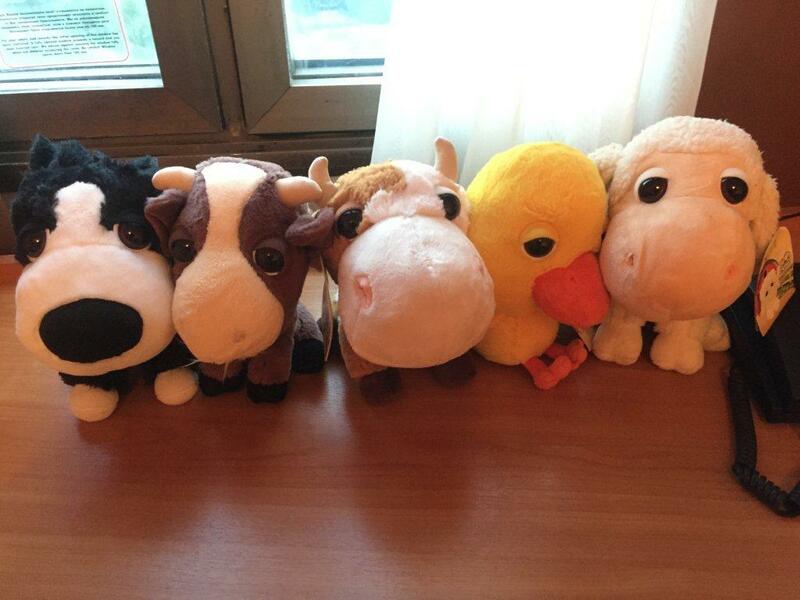 This is their tale of their trip. After 900km in one day, we ended up in Prague. All things considered, the journey wasn’t as demanding as we thought and we almost solely used the motorway. The 650km the following day brought us to Warsaw. Once again without any particular difficulty. The true and hard biker’s rhythm hit us in full on the third day: in about 11 hours we reached Rezekne, the centre of eastern Latvia and about 30 km from the Russian border. The trip was truly tiring: the Polish roads are basically a construction site awaiting for the building of motorways (that haven’t even been started), but are substituted by infinite smaller main roads that are full of thousands of trucks going in every direction. The network of roads in Lithuania and those of Latvia, which are also devoid of motorways, on the contrary were a pleasure to ride on: little traffic, uncontaminated nature and incredible and unimaginable meetings with moose, beavers, wolves and even a reindeer. 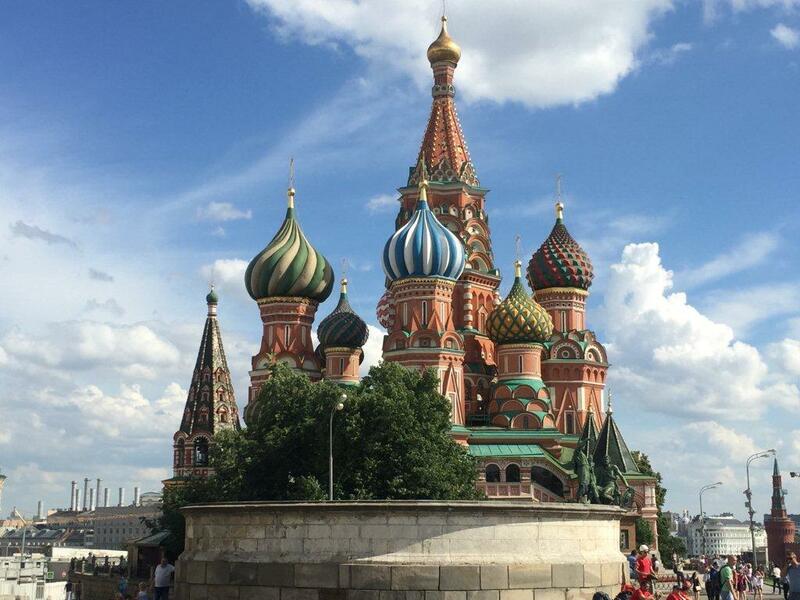 On the fourth day we entered Moscow, which was the first real stop for our project. In the Russian capital we stayed for four days and this allowed us to do a touch of sightseeing before focussing on our planned visits. The meetings were all possible thanks to the president of the association “AIUTATECI A SALVARE I BAMBINI” (Help us save the children), Dr. Bordato, and his kind availability in acting as translator for us. “President Putin wanted the new centre to be built”, he explained to us during the visit to the old building next to the current complex. 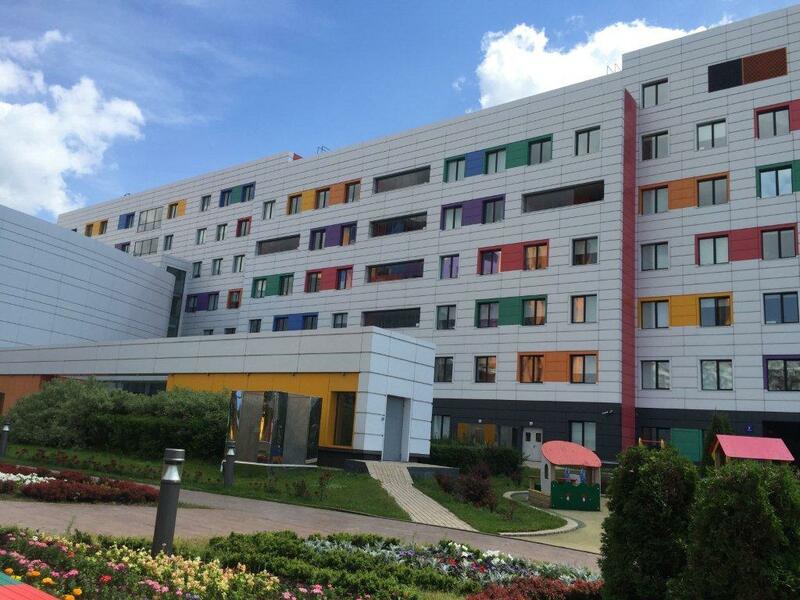 80 million euros were supplied so that the doctors could create from scratch, in just 3 years of hard work, the paediatric cancer centre which today is the most important one in Russia and one of the most prestigious in Europe. Currently, there are around 1,000 small patients, being taken care of with the best medical technologies available, which can easily be described as cutting edge. The structure is made up of apartments for families of inpatients and there is also a school with a number of classrooms which allow the children to continue their studies even while under therapy. Our visit ends with the request of a professor to not think about Russia only in terms of its political situation, but on the contrary, to think about the Russians who are so eager to open themselves up to the world and share ideas and opinions. The programme includes a visit to the orphanage, a structure managed by volunteers and financed by private donations. The children who live there, besides being orphans – they explain – are all undergoing cancer treatment or have a physical handicap. The centre takes care of these children until they become adults (18 years old). In some cases it’s possible to help these children enter into society by finding them a job and accommodation, while the orphanage continues to take care of the more serious cases and the structure becomes their definitive home. When we arrive there are only 10 young guests: the other kids (about 20) are at the sea for a few days. The Orphanage is located on the outskirts of the city, in the middle of the countryside with absolute quiet all around (a conscious choice to help the guests find a bit of serenity) and it has 3 floors. Unfortunately, there is no lift, and when we make a comment about this the answer is that the children who are not able to go up and down the stairs themselves, are carried. This oversight is not insignificant, when thinking about the children with deformities of the lower limbs, however, when you see the love that shines from the eyes of these selfless volunteers, all questions fade away. The kitchen is fully functioning and most of the bedrooms, which have two beds, are perfectly tidy and clean. Teddy bears, pieces of paper to draw on and felt-tip pens complete the picture of a location perfectly suited to the young guests. Not to forget the classrooms where teachers and psychologists work together and the play room. The garden of the orphanage is large and even has a small blow-up swimming pool. It is explained to us that the mentality and the culture still entrenched in Russia and in other neighbouring countries is to consider a disabled person not as ‘a person to help and to help assimilate in society, exactly like any other”, but rather, and often the families are to blame, to isolate them. The afternoon continues with a visit to Casa dell’Accoglienza, founded and financed by the non-profit “Aiutateci a salvare i bambini” (Help us save the children) with which we planned this trip. Once again, we find ourselves outside the city surrounded by greenery. About twenty families with their children are currently being looked after at the R.D.K.B. centre, as inpatients at the day hospital. The majority of the youngsters have various forms of tumours, ranging from skin to bone cancers. There are then other patients with evident deformities due to car accidents. We are surprised by the large kitchen with many hot plates and five fridges that we are told were donated by Indesit. On the first floor are rooms that house the parents and siblings of the young patients. The children touch us with their simplicity and ingenuity despite their serious illnesses. We’d like to talk about one in particular. He is about 6/7 years old and we first notice him seated on the sofa next to his mother. As soon as he sees us he covers his face with his hands. Unfortunately, the disease has completely deformed him and this condition makes him shy with the other children and visitors. Also here, we leave gifts of teddy bears and colourful balloons. Debora tried to interact with the boy and bit by bit he opens up slightly. He finds the courage to move his hands to pick up a teddy bear. It’s one of those moments that are really hard to hold back the tears, and that makes you feel completely impotent in the face of such suffering. At the same time, it makes you find the strength and the desire to continue what you are doing no matter the difficulties, for the rest of your life. Back on the road, we head to St Petersburg. The distance from Moscow is about 750kms, the trip is tedious in that there are long roads that cross densely populated cities with intense traffic. The city is totally different from Moscow. Not as clean as the capital, but significantly more dynamic and younger. We arrive during the period of the white nights, and thousands of people spill out onto the street, with street musicians all over the place, the atmosphere is lively, with everyone enjoying the long, summer daylight hours. It gets dark only around 12:30am, and by 3:00am the sun is already shining brightly. Our meeting with FONDAZIONE PROSPETTIVE allows us to discuss some terms regarding healthcare with some very open and willing young volunteers. The headquarters is in an apartment on the outskirts of town made up of a kitchen, two bedrooms, a living room with a gym for therapy with some equipment and a bathroom. A young volunteer welcomes us together with two young guys in wheelchairs. The representative of the Foundation who is accompanying us on this visit, explains the thousands of difficulties they have to face in giving assistance to more than 100 people (a commitment that includes more than just the people in the house). The funds arrive from private donations and equivalent German and English centres. We ask for details about the more urgent needs, so as to evaluate all possible future forms of aid. In the following days we reach Riga, Latvia and Vilnius in Lithuania. beautiful, animated, with splendid medieval city centres. From there, we head in the direction of Lublin and Krakow. Crossing Poland for the second time is really difficult: to cover 350kms, it takes us about 6 hours. It’s difficult to take less time. The average speed doesn’t go above 70/80km/h. The last two stops are Budapest and then Zagreb. In both trips, we are accompanied by moments of heavy rain that however, don’t stop us from enjoying the beauty of the landscapes we see on the way. It’s Slovakia that makes the biggest impact on us with its large alpine forests. The last stretch before home, Zagreb to Milan, really tests us. The heat is unbearable; we’re tired but happy. The motorcycling part of our journey was fulfilling, but what fulfilled us even more were the hugs and smiles of all the children we met, even if just for a few short hours. We know for absolute certain that we want to continue to try and help those in needs, children of any colour, religion or nationality. What’s our dream for the future? Work so that these brief moments can soon become that which we can focus on for all our lives.